Although there were 16 club members until Friday morning – the report can only be for one of the day walks from the week and the last day, Friday – was by far the best of the week and the one I will report on. 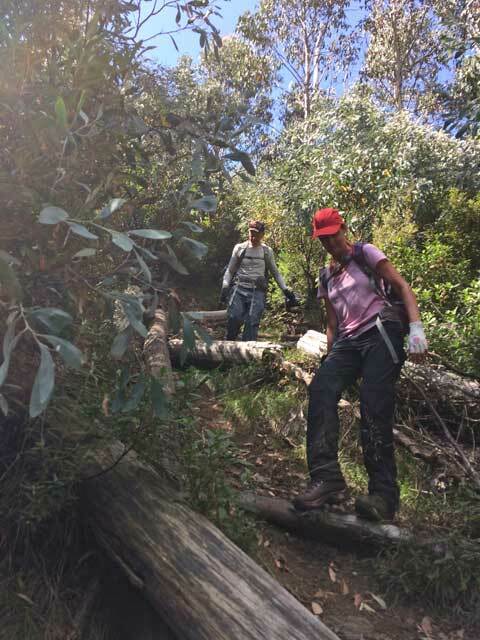 The 24km walk started at Watchbed Creek carpark and finished at Howmans Gap – which entailed a VERY long and steep descent near the end. At the briefing on Thursday night I tried hard to gag Jill who kept reiterating how bad it was, how hard it was to stay upright and that ‘there would be blood”. I was sure my memory of the descent from 2 years earlier was nowhere near as bad as she kept insinuating!!!!! We’d had stunning weather all week and the last day was to be no different. 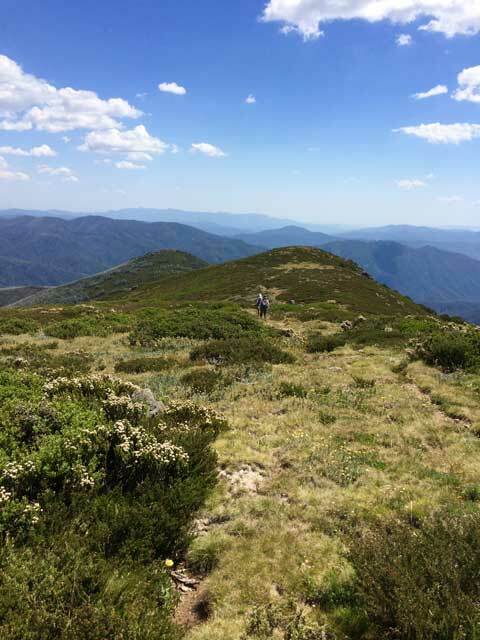 After completing a car shuffle we followed the Big River Fire trail until it joined the AAWT (Australian Alps Walking Track) and continued along at a brisk pace until we were level with Mt Nelse. 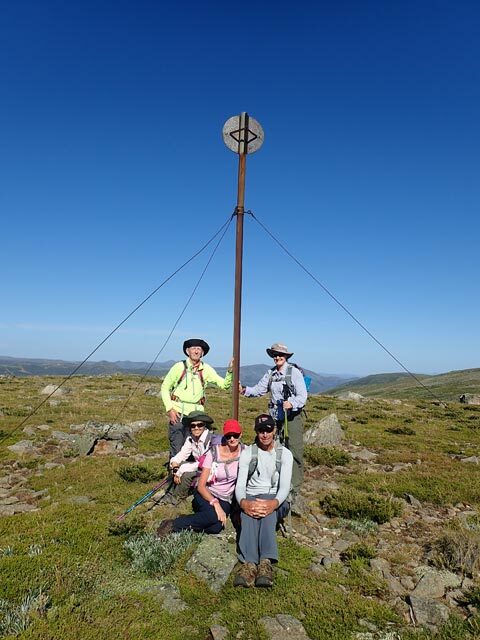 Jim, Carol, Mike, Stacey, Soo-lee and Robyn decided a cross country climb to the Mt Nelse trig at the top was in order – 1882 mtrs. 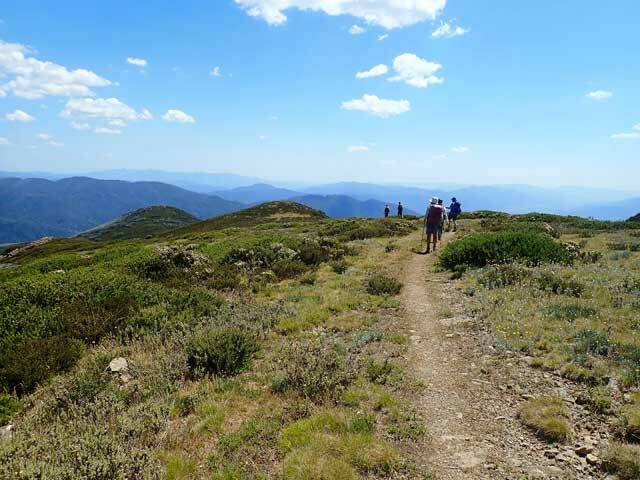 Although a bit hazy the views to Mt Bogong and back towards Hotham and Mt Feathtop were brilliant and worth the climb up. 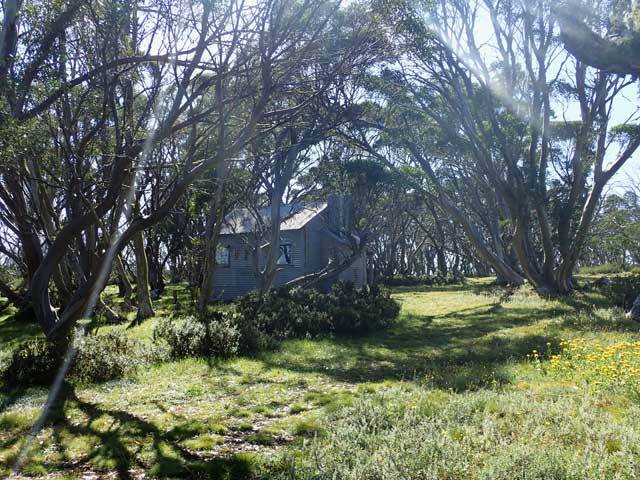 The rest of the group waited at the Spion Kopje Junction – Warby Corner – but we weren’t quite ready for that part of the walk and continued on the AAWT for another 2.5kms to Ropers Hut for a late Morning Tea. 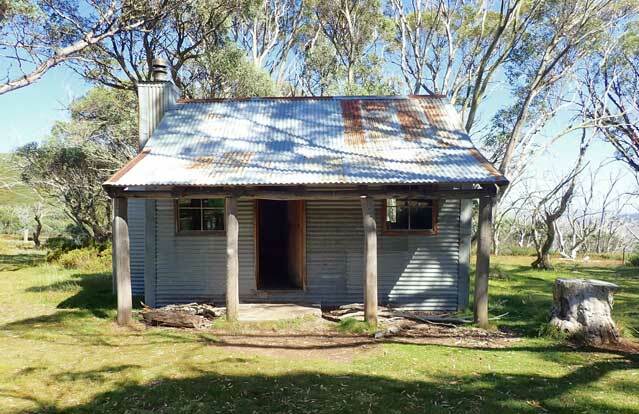 This hut, in delightful surrounds – is picture perfect. 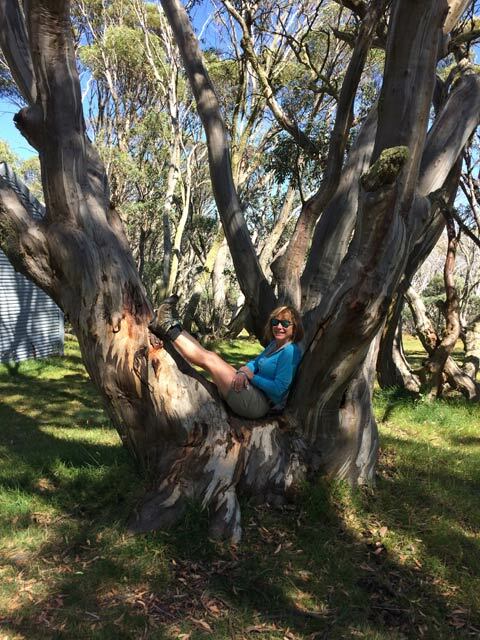 Surrounded by snow gums not ravaged by the 2003 fires, flat grassy camping areas with lots of shade, and a loo. A leisurely break and then the return trip back to the Spion Kopje Junction. The track followed the undulating ridge for 5 kms until we met an old aqueduct – lovely clean water on one side, dammed and empty on the other. 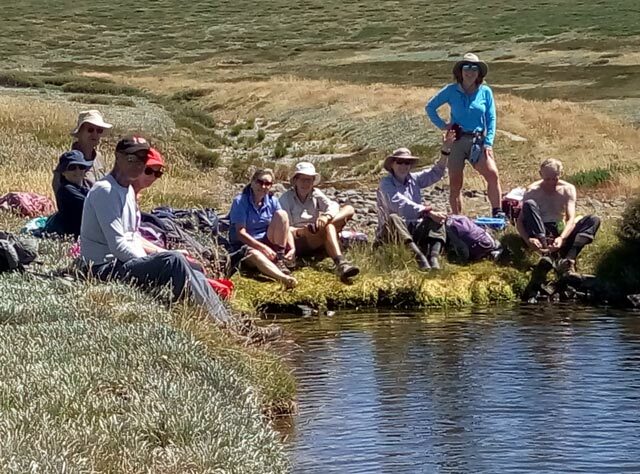 It was the perfect lunch spot and many of the group removed their shoes and dangled their feet in the cooling waters whilst enjoying their lunch. Many small fish (trout perhaps?) seemed interested in the ‘fresh bait’ but decided it wasn’t to their taste. After lunch the track followed the dry aqueduct for some time before leaving and heading uphill. Another trig a bit off-track at (the actual) Spion Kopje – 1841 mtrs only stirred the attention of Stacey, Mike, and Warwick to explore, as all were keen to get to the ‘terrible’ descent. The views on all sides from the ridge were spectacular – with the rolling mountains visible in all directions, the sun shining, blue skies and not another person or sound to be seen or heard it was serene and magical. 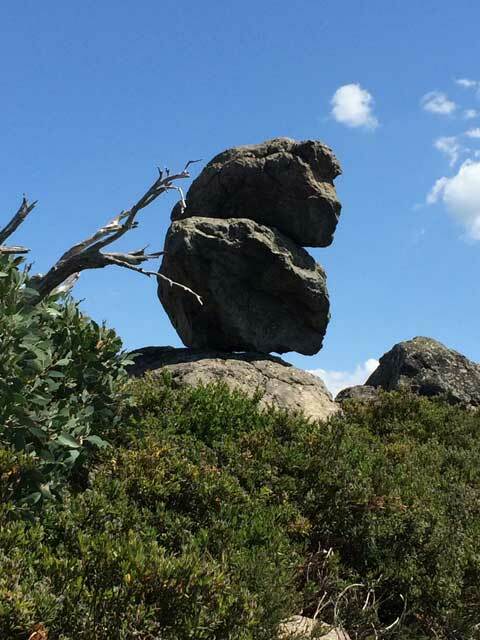 Rock formations brought out the movie buffs (see photo gallery for ET) and after a final hill climb we reached the top of the ‘terrible descent’. Initially the group were muttering “oh, this is not so bad” until I advised we weren’t at the bad bit yet! The leaf litter made the steep track particularly slippery – some effort had been made to cut fallen timber and make – not steps, but rather stoppers – so one wouldn’t slide so far. 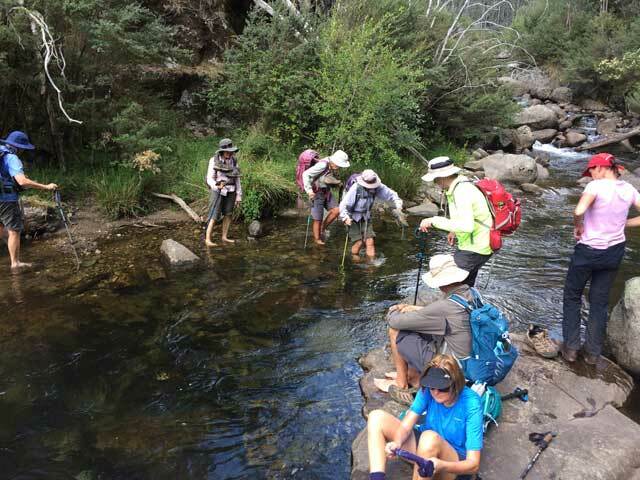 It was too difficult to take photos and all were relieved to get to the river – until Robyn advised that the large tree that used to make a bridge for the crossing was now gone. The safest place to cross entailed taking shoes and socks off and wading through to some rocks on the other side to clamber up on. Relief was short lived – the leader had conveniently forgotten to tell them about the steep climb out on the other side to the waiting cars…..haha – have to keep something up your sleeve. It was a long walk with lots of variations from heathy surrounds along the Big River Fire Trail, to the open high plains, rolling hills in the distance, snow gum forest down to and around the hut, wet and dry aqueducts, magnificent views along the Spion Ridge, finishing with rainforest vegetation down the descent to the river crossing. Showers, food and happy hour were well deserved that night and a great sense of achievement for the day.